Veggie Garden 2010 is cleaned out for the most part. Autumn leaves are mulched or composted. Garden notes are updated. Next? It’s time to throw out all the left-over seeds—you know, all those half-filled, half-empty, green-bean, tomato, chard, and carrot packets. Stop! You can save those seeds to use next spring. For years the Ancient Gardener never thought about keeping unused seeds for the next year. He just planted and planted until all were used—or just trashed the extras. At some point the Ancient Gardener started keeping the extra seeds over winter. At first he just tossed them into a container on the workbench in the unheated garage and hoped for the best the following spring, when he discovered that most sprouted quite nicely, thank you. Really, that idea that veggie seeds will germinate after a year’s storage should be no shock. Seeds of our gardening adversaries, weeds, seem to remain viable for decades. Here’s a simple way to overwinter your unused seeds: Put them in a capped jar (to minimize humidity) and keep them in your refrigerator (below 40° F). 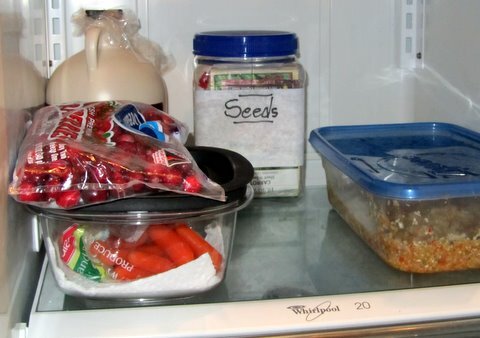 How long do refrigerated seeds last? That depends on the kind of seeds and storage conditions. The Ancient Gardener usually uses a half packet of tomato seeds one year and refrigerates the remainder for use the next year, with no significant drop-off in germination rate. He uses the stored seeds the second year so hasn’t been pushing the envelope—oops, the packet—on the storage issue. Interestingly, in some European countries seed packets often tell how long the seeds may be stored. Wouldn’t that be a convenient addition to the info blurb on the back of seed packets on this side of the Atlantic? The lack of storage information, however, is easily remedied on the Internet. Several websites list veggie seeds and the number of years they may be stored. At the Colorado State University website, for instance, the Ancient Gardener picked out representative veggies and the years their seeds can be stored: lettuce, 1 year; sweet corn, 2; beans, 3; beets, 4; and tomatoes, 5. Buy too many veggie seeds? Don’t trash your extras. Store them in your fridge and use them next year. That’s a real cool—and frugal—idea. To link to the Colorado State website, CLICK HERE.